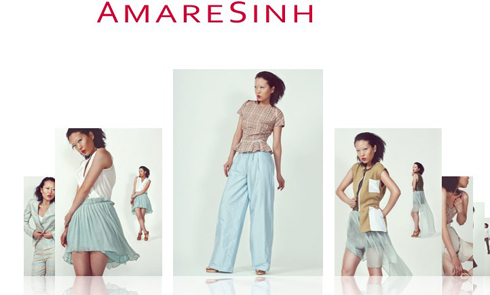 Huyen Tran, MEMP '09 graduate and Co-Founder of women's fashion line, AmareSinh, is using her MEM degree in an interesting and unexpected way. Originally from Vietnam, Tran immigrated to the US when she was little and grew up in Philadelphia. Having an interest in advanced technology research, Tran received her Bachelor’s degree in Chemistry from Temple University. "I used to work in a laser lab at Temple doing research on molecular detection and selective segmentation of molecules using lasers," she recalls, "and while I am still very interested in science, I am more of a business person nowadays and can't see myself working in a lab." Throughout her career, Tran has pursued a number of entrepreneurial ventures. After graduating from Temple, she returned to Vietnam with the hope of returning to her ethnic roots, and founded her own non-profit organization, the Hue Happy Project. “We teach children who are not in school and forced to work by their parents how to make handicrafts such as necklaces, bracelets, and earrings, instead of working on the streets where they are exposed to all kinds of danger. Profits then go into schooling and materials for school,” she says. When Tran later returned to the US, she worked with a company that developed technology for clinical trial management. But because she was always looking for new opportunities to develop professionally, Tran enrolled in the MEM Program in May 2008. “I saw the program as a way for me to gain knowledge on a more holistic scale and advance my thinking” she says. “I have so many great memories of Duke, but Camp Out was probably my best - I did not make it past the first night!” she laughs. After graduating from Duke, Tran’s brother, who studied Fashion Design at the Fashion Institute of Technology (FIT) in New York, approached her with an idea to start a women’s clothing line. Coined from two words, "Amare" which means love in Italian and "Sinh" which means birth in Vietnamese, the name “AmareSinh” commemorates through clothing, the love, appreciation and beauty of life. Tran admits that given her knowledge of entrepreneurship and business learned at Duke, the bold move to start AmareSinh was less frightening. While Tran’s career is testament to the diversity of professional options available to MEM students after graduation, she reflects that the path to starting one’s own company is far from easy. AmareSinh continues to grow as a company and has released four different collections, some of them also with accessories. More information can be found on all major social networks and at AmareSinh.com.